Pump Gyms are a low cost, high spec, access anytime, local gym. With gyms in Hatfield, Watford, Stourbridge and Northampton they offer the very best in local gym memberships, with 24hours access, experienced trainers and staff and latest in modern cardio and strength equipment. Pump Gym are highly secure and safe environments with state-of-the art security measures keeping members and staff safe. With a reputation in providing robust and reliable access control solutions, Pump Gyms contracted Vistec Systems to supply and install a safe and secure entry point to the Hatfield facility. Vistec Systems were tasked with supplying a secure access control system to control and monitor entry access for their members, Pump Gym also required self-service enrolment points to allow their clients to enrol for membership themselves and include fingerprint registration for acquiring entry permissions. Vistec Systems were also asked to provide an intelligent solution to integrate into current security parameters to help combat issues with ‘PIN sharing’ between members and non-members, which is a common concern within membership lead facilities. Having supplied and installed double security portals controlled by the Paxton Net2 access control system, Vistec Systems upgraded the system to include a level of biometric security. ievo Ltd.’s advanced fingerprint readers were chosen as the perfect solution due to Vistec Systems having worked with the products on multiple sites and seeing the reliability and success they bring to access control systems. The ievo ultimate was installed to help control access to the Hatfield site, providing peace of mind to Pump Gyms that only registered members would be granted entry, and removing the issues of PIN sharing that previously caused concerns. 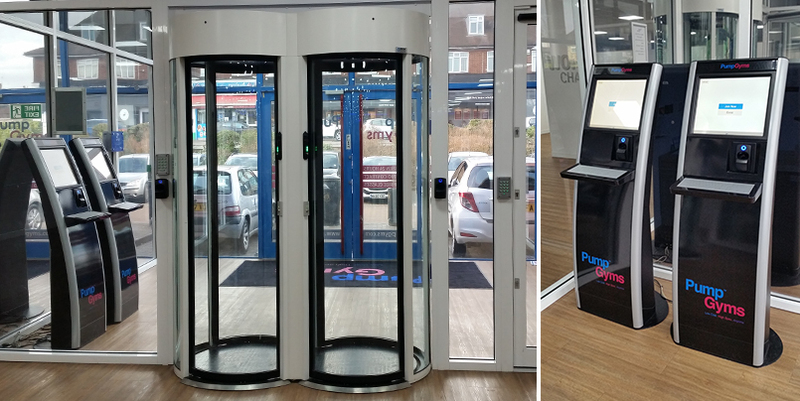 Due to ievo solutions being seamlessly integrated into the Paxton Net2 access control systems, there was reduced installation time, meaning that members were able to enrol and use the facilities with little restrictions. The system was implemented to be controlled by third party software who host the software on cloud based servers. ievo readers were installed on the main entrance door and the changing rooms, Vistec Systems also installed ultimate readers into enrolment kiosks, which allow members to self-register their biometric fingerprints for instant access to the site. Since inception, Pump Gyms have seen a positive effect of the new biometric controlled access points. Seeing an increase in membership registrations, and a rapid decrease in non-members gaining access to facilities. Members have praised the new system in its simple and effective functions, and have found the readers easy to use and manage their memberships.